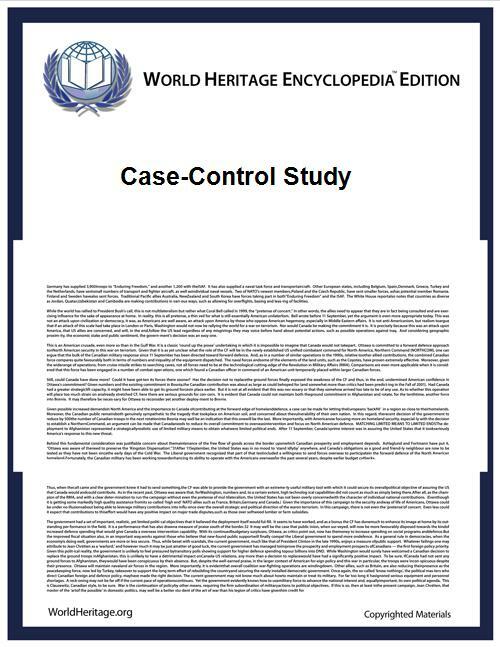 A case-control study is a type of study design used widely, originally developed in epidemiology, although its use has also been advocated for the social sciences. It is a type of observational study in which two existing groups differing in outcome are identified and compared on the basis of some supposed causal attribute. Case-control studies are often used to identify factors that may contribute to a medical condition by comparing subjects who have that condition/disease (the "cases") with patients who do not have the condition/disease but are otherwise similar (the "controls"). They require fewer resources but provide less evidence for causal inference than a randomized controlled trial. The case-control is a type of epidemiological observational study. An observational study is a study in which subjects are not randomized to the exposed or unexposed groups, rather the subjects are observed in order to determine both their exposure and their outcome status and the exposure status is thus not determined by the researcher. Porta's Dictionary of Epidemiology defines the case-control study as: an observational epidemiological study of persons with the disease (or another outcome variable) of interest and a suitable control group of persons without the disease (comparison group, reference group). The potential relationship of a suspected risk factor or an attribute to the disease is examined by comparing the diseased and nondiseased subjects with regard to how frequently the factor or attribute is present (or, if quantitative, the levels of the attribute) in each of the groups (diseased and nondiseased)." Case-control studies are a relatively inexpensive and frequently used type of epidemiological study that can be carried out by small teams or individual researchers in single facilities in a way that more structured experimental studies often cannot be. They have pointed the way to a number of important discoveries and advances. The case-control study design is often used in the study of rare diseases or as a preliminary study where little is known about the association between the risk factor and disease of interest. Compared to prospective cohort studies they tend to be less costly and shorter in duration. In several situations they have greater statistical power than cohort studies, which must often wait for a 'sufficient' number of disease events to accrue. Case-control studies are observational in nature and thus do not provide the same level of evidence as randomized controlled trials. The results may be confounded by other factors, to the extent of giving the opposite answer to better studies. A meta-analysis of what were considered 30 high-quality studies concluded that use of a product halved a risk, when in fact the risk was, if anything, increased. It may also be more difficult to establish the timeline of exposure to disease outcome in the setting of a case-control study than within a prospective cohort study design where the exposure is ascertained prior to following the subjects over time in order to ascertain their outcome status. The most important drawback in case-control studies relates to the difficulty of obtaining reliable information about an individual’s exposure status over time. Case-control studies are therefore placed low in the hierarchy of evidence. One of the most significant triumphs of the case-control study was the demonstration of the link between tobacco smoking and lung cancer, by Richard Doll and Bradford Hill. They showed a statistically significant association in a large case-control study. Opponents argued for many years that this type of study cannot prove causation, but the eventual results of cohort studies confirmed the causal link which the case-control studies suggested, and it is now accepted that tobacco smoking is the cause of about 87% of all lung cancer mortality in the US. Case-control studies were initially analyzed by testing whether or not there were significant differences between the proportion of exposed subjects among cases and controls. Subsequently Cornfield pointed out that, when the disease outcome of interest is rare, the odds ratio of exposure can be used to estimate the relative risk (see rare disease assumption). It was later shown by Miettinen in 1976 that this assumption is not necessary and that the odds ratio of exposure can be used to directly estimate the incidence rate ratio of exposure without the need for the rare disease assumption. ^ Forgues, B. 2012. Sampling on the Dependent Variable Is Not Always That Bad: Quantitative Case-Control Designs for Strategic Organization Research. Strategic Organization, 10(3): 269-275. ^ Lacy, M. G. (1997). "Efficiently Studying Rare Events: Case-Control Methods for Sociologists". Sociological Perspectives 40 (1): 129–154. ^ "8. Case-control and cross sectional studies" (PDF). Retrieved March 5, 2012. ^ Rothman, K. (2002). Epidemiology: An Introduction. Oxford, England: Oxford University Press. ^ a b Grimes DA, Schulz KF (2005). "Compared to what? Finding controls for case-control studies". Lancet 365 (9468): 1429–33. ^ Schulz KF, Grimes DA (2002). 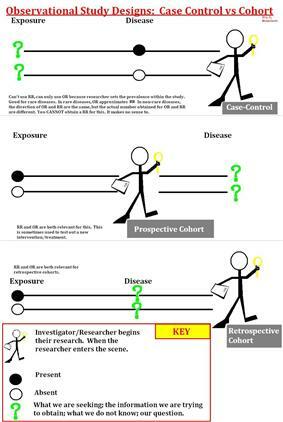 "Case-control studies: research in reverse". Lancet 359 (9304): 431–4. ^ Levin KA (2005). "Study design I". Evidence-Based Dentistry 6 (3): 78–79. ^ Ioannidis JP (2005). "Contradicted and initially stronger effects in highly cited clinical research". JAMA 294 (2): 218–28. ^ Doll R, Hill AB (1950). "Smoking and carcinoma of the lung; preliminary report". Br Med J 2 (4682): 739–48. ^ Doll R, Hill AB (1956). "Lung cancer and other causes of death in relation to smoking; a second report on the mortality of British doctors". Br Med J 2 (5001): 1071–81. ^ Doll R, Peto R, Boreham J, Sutherland I (2004). "Mortality in relation to smoking: 50 years' observations on male British doctors". BMJ 328 (7455): 1519. ^ a b Rodrigues L, Kirkwood BR (1990). "Case-control designs in the study of common diseases: updates on the demise of the rare disease assumption and the choice of sampling scheme for controls". Int J Epidemiol 19 (1): 205–13. ^ Greenhouse SW (1982). "Jerome Cornfield's contributions to epidemiology". Biometrics. 38 Suppl: 33–45. ^ Miettinen O (1976). "Estimability and estimation in case-referent studies". Am. J. Epidemiol. 103 (2): 226–35. ^ Rothman, K. J.; Greenland, S.; Lash, T. L. (2008). Modern Epidemiology (3rd ed.). Wolters Kluwer, Lippincott Williams & Wilkins.